Happy Labor Day everyone! Of course, since this post is coming at you late in the day, the holiday will be over by the time most of you read it, so happy Tuesday! The long weekend turned out to be a great one. Not only was the weather beautiful, but spending the weekend on the lake while boating, tubing, and over indulging on lobsters and grilled food made for a perfect ending to the summer. I thought for sure we were going to get hit with tropical storm Hermine today, but the weather was quite pleasant. It was sunny with a cool breeze, which made me experience some major fall fever, and ready to break out my leather jackets. However, I'm not quite ready to put away my summer dresses yet, but that's what I love most about fall dressing, I get to wear layers and transition my summer clothes into the new season. 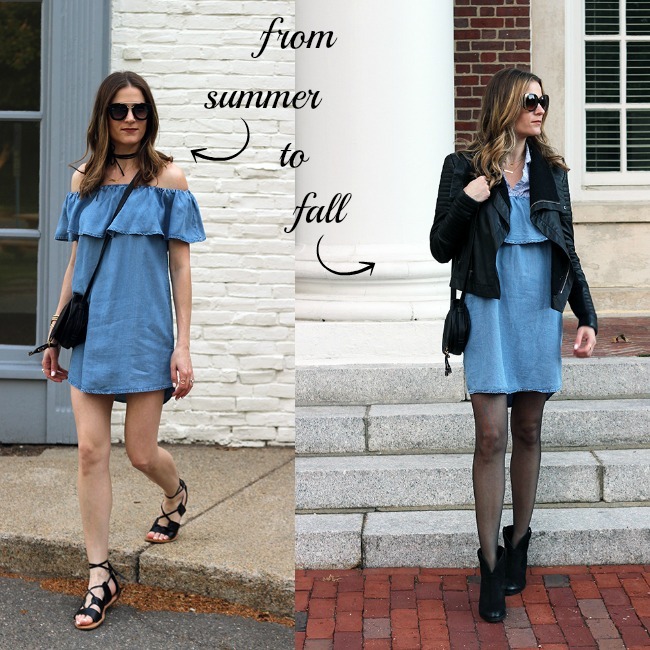 So today I'm sharing some tips and tricks for making your summer dresses work for the fall. The first tip is to add a warm over layer to your dresses, such as a blazer, sweater, or my personal favorite, the leather jacket. Since a lot of summer dresses tend to have feminine feel, I love the juxtaposition that a leather adds, toughening up the look. However, if you want your dress to have a preppy or more professional feel, a blazer would be a great layering choice, and an open cardigan would add a soft, feminine touch. The second trick is to layer a top under your dress. You've probably been seeing this look a lot with the ode to the 90's circling back (such as the tee shirt under the cami dress), but I love how this extends the wear of your summer items. I layered a button down under my dress for a fun, and slightly dressier look, but if in doubt of what to wear underneath, you can never go wrong with a turtleneck. A fitted turtleneck pretty much looks great under everything (I cant wait to try it under my slip dress this fall), and there is a sleekness they add to every look. I also recommend wearing a bodysuit under your dresses, because that way they will stay in place. The one thing that bothered me about my look, is the shirt kept riding up. A button down bodysuit would of been a better option. The third tip is to wear tights, leggings, or jeans under your dresses. Yes, tights can make any dress more appropriate for the cooler weather, but have you tried wearing your dresses over jeans? Often, you will find me tucking my dresses into my jeans giving it a top-like feel, but I also love layering them over skinny jeans or leather pants giving my dresses a tunic look. 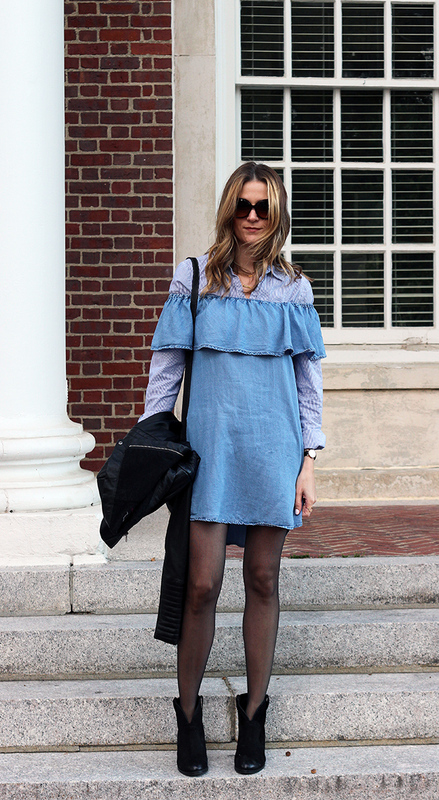 The final trick is to pair your dress with a bootie or over-the-knee boot. Adding a bootie to your dress will instantly give it a fall feel, but if you want to take it up a notch, wear a over-the-knee boot. Not only do they they make your dress appropriate for the cold season, but since they cover your legs, they add an extra layer of warmth. I'd love to hear, what are some of your favorite fall transitional tricks? That is the perfect black moto jacket, I love it! I love this, looking good Rachael and what a neat themed post! Once I get a leather moto jacket I am definitely trying this out. I love how you transitioned this into Fall. The black accessories go so well with the blue dress. Sounds like you had such a fun weekend! Love how you transitioned this dress. Looks amazing both ways! Love your layers here! I wouldn't have thought of that but it looks fabulous! Gorgeous, you look cute..Thanks for the tips. Such a fun look! I love how you brought the summer dress to fall! It looks perfect with the moto jacket! Very creative!! It's a seamless transition! such creative layering with the button-down shirt and love that jacket! What a great idea! Looks fantastic! You give me inspiration to wear it like that. Such a amazing look for fall. You looks so fabulous. such a fun look. i wouldnt have thought about that pairing but it works for you! So glad you had fun at the lake over the weekend! I am so impressed with your layering. I wouldn't have thought of a top underneath. You are a genius! I feel like I'm so uninventive when it comes to taking things from summer to fall, I can only think to put a sweater or jacket on top, lol. Thanks for the great idea! So cute! I love how you showed an outfit you already posted and how to make it wearable for Fall! So many times I feel like fashion bloggers only wear an outfit once and then talk about buying new ones for Fall! Reality is that you can't buy a new outfit everyday so this post is perfect for me! Love using a moto jacket or jean jacket to transition my outfits into Fall! Great look, I love how you layered this! This outfit is beyond fantastic, legit! I love how creative and stylish you were with all the layers here especially layering the button-down underneath. I own an almost identical dress and will try it with a bodysuit under it. This turned out fantastic and the awesome leather jacket is the icing on the cake. I am glad you enjoyed a delightful Labor Day weekend! I am talking a little bit about that in today's post.